Our seeds are open pollinated and heirloom, period. Moreover, we do not use any GMO, hybrid (F1), seeds with PVP's or patented seed for sale. All seed is open pollinated or heirloom and made to be freely shared and improved upon as humans have been doing for centuries. 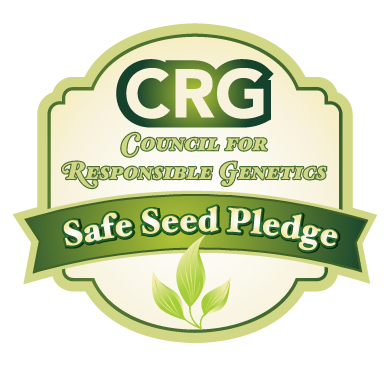 To that end, we recognize the original breeders of new or novel varieties by giving them credit in seed descriptions as well as voluntarily paying them a royalty for their work. To increase biodiversity and keep innovation open for everyone, our varieties for the sale to the public must also be open and free to use and we do not consent using our germplasm in any patenting structure. We not only maintain heirloom varieties for sale, re-select and improve varieties, but breed new varieties for resiliency and taste.